The Art department consists of three highly experienced members of staff. Our aim is to provide our pupils with a challenging, exciting and broad art and design curriculum experience where they can learn to develop skills in a range of areas through various, interesting programs of study. The department strives to ensure that the materials that pupils use are of the best quality. We pride ourselves on being well equipped and well resourced. We also make every effort to provide pupils with the opportunity to buy their own art equipment at the cheapest possible rate. Pupils have been highly successful within this department from Key Stage 3 through to examination level in GCSE, AS and A level. Every year we see many of our pupils go on to study Art & Design at a higher level and many of our past pupils have built new and exciting careers for themselves in the Creative Industries, which is the fastest growing sector of UK Industry. Pupils have the opportunity to go on a variety of museum and gallery visits. 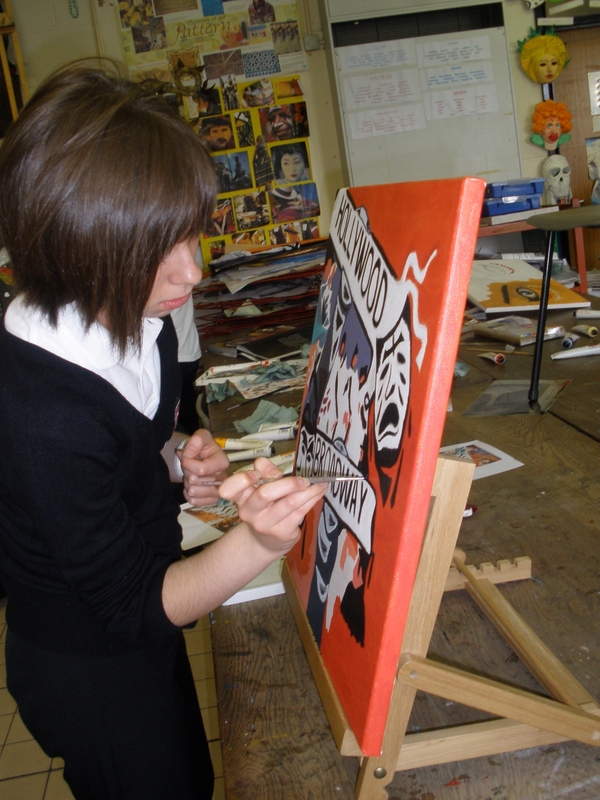 Pupils also have the opportunity to work with visiting artists or to work on Community projects. We strive to provide as many enrichment art activities as possible. At Key Stage 3, pupils are introduced to the basics of painting, drawing, colour mixing and printmaking by focusing on still-life in year 7. They then they build upon this with an understanding of portraiture and model making in year 8 and finally they look at their environment in year 9 through lino printmaking, mural work and graffiti art. Pupils are expected to keep a sketchbook within which they can complete their homework tasks. 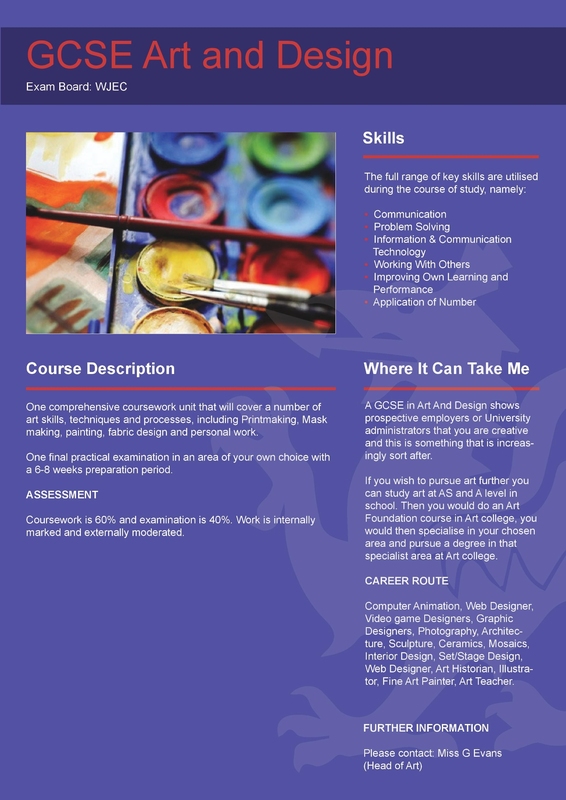 Uniquely, in our art department, homework is a mini-project produced over a six week period which encourages high levels of independent learning and sets pupils up well for taking the subject into GCSE.